Eventful. That is how one may describe June 2018 for Puma; the brand most recognizable in the modern day for its running and lifestyle divisions is changed the brand’s narrative in just one month’s time. Two decades has passed since the Puma logo was seen on the hardwood; back when a young Vince Carter entered the NBA. Absent from the game for 20 years, the brand is carrying the belief that there is no time quite like the present to make a return. Now seven months removed from Puma reentering a market that for a generation has not known Puma to have a basketball division…the brand is doing quite okay for themselves. In fact before June 2018; there was an audience that were perhaps completely oblivious to Puma having a basketball past. Some may just know Walt ‘Clyde’ Frazier as a voice of the New York Knicks television broadcasts, but not the 2x champion who signed with Puma in 1973. And was awarded a lifetime contract with the brand shortly after the re-entry. In the modern-day; the hardwood has been dominated by Nike and Jordan Brand…with an Adidas presence and Under Armour being the most recent of the footwear “giants”. But Puma is indeed making their own path, and doing so with house money. Why after two decades is Puma back in the basketball space? Those are reasons found within the brand’s German headquarters and among stockholders..however, what you can guarantee is, Puma is playing with house money. Low risk. High reward. How else could you explain the targeting and signing of Deandre Ayton (no. 1 pick of the 2018 NBA Draft), Marvin Bagley III, Michael Porter Jr. and Zhaire Smith. Before the ink dried on the deals of those four; the brand was reportedly targeting Trae Young formerly of the Oklahoma Sooners who signed with Adidas Basketball. And added young 2017-18 playoff sensation “Scary Terry”, Terry Rozier. Targeting only the marquee names in the incoming NBA draft class; Puma’s is making their play directly to the new generation…a generation which has not witnessed the golden age of the basketball sneaker. Sure, the kids have their favorites; LeBron James, Stephen Curry, Kevin Durant…but those superstars are locked into their Nike and Under Armour contracts. With LeBron rumored to have a lifetime deal with the Swoosh and Curry having shares in the very fabric of Under Armour itself. While this is in fact the loudest move Puma has made in basketball since 1998, it is not the first, as Skylar Diggins-Smith pointed out when shooting down a Twitter Moment chronicling the signing of the draft prospects. It was indeed Diggins-Smith who was the experimental foray into basketball for Puma. Do better Twitter Moments! However, Puma did anchor its roster with the help of veterans Rudy Gay and Danny Green; coupled with gold medalist and All-Star, Demarcus Cousins. With Boogie Cousins undoubtedly being the anchor and biggest grab for the brand. Balancing the direction and re-entry into the basketball market is the business and cultural acumen of Jay-Z. The rapper turned business mogul boasts an impressive reported net worth of $810 million and probably increasing by the second…let that sink in. The move legitimized Puma’s play while offering flexibility in the way of marketing. Much like we’ve seen with brands in the past, the tactic of using celebrity to legitimize a venture, product or brand is almost paramount to success. It is certainly commonplace. Capitalizing on Jay’s influence and marketability coupled with his business savvy is a staking yet another pillar and driving it into the ground that has become the foundation of Puma’s basketball play in 2018 and beyond. Because the people behind the scenes are just as important as the signees, and those aspects in concert provide a favorable and progressive brand to the masses. That is a winning strategy. That is a winning play. Previously alluded to was the phrase; low risk, high reward. 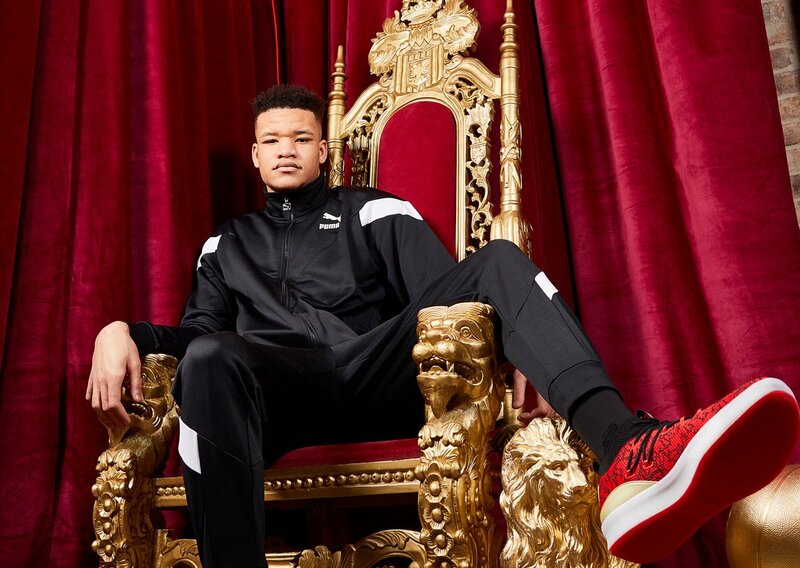 When it was first revealed Puma wanted to bring on Trae Young to reportedly be the face of their brand and overall resurgence into basketball…but the collegiate standout decided against joining Puma. Instead joining the established Adidas Basketball crew. But that shows in itself, the strategy Puma was going after and that is taking a crop of young talent, lottery level talent…and essentially betting the proverbial farm on the talent. Think of it as when a baseball club trades their star prospect for an established vet (in this case Rudy Gay or Danny Green) and a plethora of minor league prospects to surround a marquee free agent to follow; in Boogie Cousins. Puma’s plan of [proverbially] going 4-for-4 from the plate with two doubles and 2 singles in the present while building for the future [the 3-run home run, two batters later] is the hope that the return on investment will net them superstars, and in turn market them and turn their popularity into sales. Which in turn is a win for Puma. Puma is playing the long game…and it appears in their direction…the brand is not just looking for the immediate splash. Puma did enough to get people talking and eyeballs on them and for all intents-and-purposes, the brand has done things right and by the book. We’re not looking at a brand looking at things from a sprinter’s mentality – but instead, looking at it from the perspective of a marathon. Keeping silhouettes close to the vest, ushering out a retouched Puma Clyde with a modern fit. But by also bringing a new silhouette; the Uproar. Puma is not pressing the issue, Puma is not forcing silhouette after silhouette down the consumer’s throat, they are simply buying their time and moving the ball – swinging the rock around the court looking for the best shot. Efficiency. And that is the name of the game. It is playing the smart, efficient, station-to-station – that is how you build a sustainable future. And not bet the farm and better the house and in hopes of things panning out and fading away. It is block-by-block, brick-by-brick. One atop the other supporting each other, that is how you build a foundation, that is how you build the next level and the next and the next. It is the slow build, the long game that Puma is playing and effectively doing a good job at.